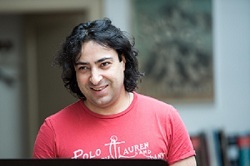 Rodion Pogossov was born in Russia and established himself after joining the Lindemann Young Artist Programme at the Metropolitan Opera. Conductors he works with include James Levine, Jean-Christoph Spinosa, Enrique Mazzola, Kent Nagano and James Conlon, appearing regularly at world-class houses including the Metropolitan Opera, Glyndebourne, Hamburgische Staatsoper, Michigan Opera Theatre, Cincinnati Opera and the Deutsche Oper Berlin. His operatic roles include Guglielmo Così fan tutte, Figaro Il Barbiere di Siviglia, Silvio Pagliacci, Marcello La Bohème and the title role in Don Giovanni. Also an excellent recitalist, he frequently performs works including Orff’s Carmina Burana, Faure and Brahms Requiem and Rachmaninov’s The Bells, to name a few. A recording artist, his discography includes his solo song recital disc for EMI, which received great acclaim and a disc of Rachmaninov songs with pianist Iain Burnside. For Opera Rara Rodion appears on Bellini’s Adelson e Salvini (released February 2017).